Have you ever wondered if cooking a food can have an affect on its nutritional value? There are several nutritional factors that can be affected by eating hot or cold foods. Such factors include the rate of absorption of nutrients, digestion and the amount of certain vitamins and minerals in the food. There are several ways to improve digestion, such as eating at a slow pace and making sure all your food is chewed properly. Another way to improve digestion is to eat hot vegetables rather than cold. The digestion of cold vegetables such as carrots, apples and pears begins in the mouth resulting in more work for the body. On the other hand, the digestion of hot foods, such as baked fruit or vegetables, begins with cooking, when the food's chemicals begin to be broken down before they enter the body. By improving digestion, nutrients from such foods will be more easily absorbed therefore increasing overall nutritional value of the foods. A study completed in 2002 by the "Journal of Agriculture and Food Chemistry" showed that cooking vegetables such as tomatoes actually increases the amount of lycopene in them. Lycopene is found in foods such as tomatoes, watermelon, red peppers, papaya and is linked to lowered risk of cancer and heart attacks. Vitamin C is another important antioxidant that helps boost the immune system. A downside of hot vegetables is that they lose significant amounts of vitamin C in the cooking process. Most people have their reasoning as to why they like to drink their water warm or cold. Generally, people drink cold water because it is refreshing and cools the body. Nutritionally, cold water is absorbed more quickly than warm water and therefore decreases risk of dehydration. Furthermore, drinking cold water may actually help burn more calories as the body has to heat the water. Drinking warm water also has its benefits, as it is said to aid in digestion and help detoxify the body. Both hot and cold cereal have nutritional benefits, however the type of hot or cold cereal you choose may make a difference. Often times cold cereals are coated with sugar and have lost many of their nutrients through the milling process. Choosing a low-sugar, high-fiber cereal will help to improve nutritional values. Hot cereal, such as oatmeal, contains large amounts of fiber. 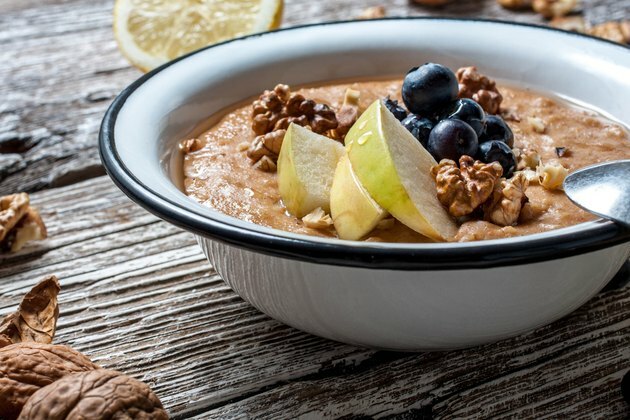 The high fiber content of hot cereal aids in keeping you full longer and increases the amount of time until your next meal, which may also aid in weight loss.